You will also learn simple EEM techniques that will empower you in supporting your own health and healing. Reiki is a Japanese technique for stress reduction and relaxation that also promotes healing. Each treatment feels like a wonderful glowing radiance that flows through and around you. It works through your entire being: body, emotions, mind and spirit to create feelings of relaxation, peace, security and wellbeing. Reiki is a simple, natural and safe method of spiritual healing that always creates a beneficial effect and has been effective in helping to treat many forms of illness. It also works in conjunction with all other medical or therapeutic techniques to relieve side effects and promote recovery. You will learn how to strengthen your meridians, chakras, lymphatic and nervous systems while balancing while balancing the right & left brain hemispheres. * Specific exercises for balancing hormones, thyroid health, PMS, menopause and stress reduction can be added. * For this class you can bring a friend and he or she will get a 50 % discount. Understanding the basics of nutrition and how to apply them in a way that works for you. It's all about feeling healthy, looking great and having more energy without counting calories or giving up the foods that you love. This is a valuable practice in body awareness that is designed to switch off your "flight or fight" stress reactions while switching on your body's natural relaxation response. Once learned it will become a lifelong skill that will be an integral part of your healthy lifestyle. 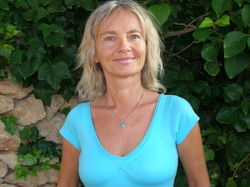 Below you will find a variety of interesting articles on Holistic Health and Healing written by Sabina. The ability of the human body to maintain health and overcome illness is among nature’s most remarkable gifts, but sometimes it gets overwhelmed and help is needed. There are a multitude of healing systems out there so it can be confusing to find the ones that work best for you. We are all individuals and what helps one person to recover might do nothing for another with the same illness. The key is to be open minded and go with what feels right for you. I experienced this for myself in 2001, when I was diagnosed with MS and had problems walking, lifting my arms, sitting and concentrating. I was terrified at the prospect of ending up in a wheelchair, so I dedicated myself to doing whatever it took to regain my health. As an alternative health practitioner I have studied and practiced a variety of natural and holistic healing modalities and have come to appreciate the great potential of Energy Medicine which is an innovative blend of ancient wisdom with contemporary healing techniques. I have found that Eden Energy Medicine (EEM) in particular is a powerful practice that restores the body, mind and spirit to their inherent balance. This natural and safe treatment eases pain, releases stress, strengthens your immune system and balances your hormones. You hear a lot lately about living a healthy lifestyle but what does it really mean? In general a healthy person doesn't smoke, maintains a healthy weight, eats good food and exercises daily. Sounds very simple doesn't it? teach them how to help themselves.